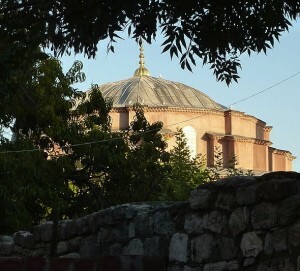 The Church of Divine Wisdom – Hagia Sophia – has a place among the greatest architectural masterpieces of the world. Through the ages the church has undergone many changes and alterations, but nothing can ruin the awe and magic that visitors feel. The church was inaugurated in 537 under the Emperor Justinian. 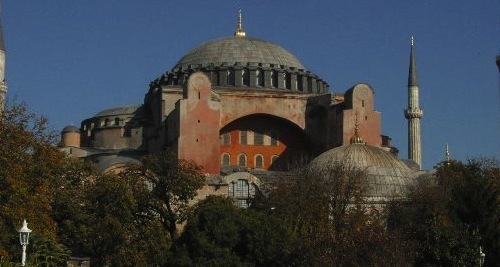 In the Frankish period, Hagia Sophia was converted into a Roman Catholic Church. After 1453 it served as mosque, eventually being turned into a museum in 1935. The buttresses, that were added to support the massive building, have altered the outer shape partially, as have the added minarets and mausoleums. In order to replace the two older, wooden basilicas, which had burned down one after the other near the palace and the Hippodrome, Justinian decided to build a bigger and grander church on the site. The emperor assigned the construction of the church to the architects Anthemius and Isidore, who for the first time added a large dome to the square basilica plan. The weight of the dome is distributed through the pendentives to four massive pillars. Between them four large arches are formed, above which the dome appears to float. The central space is flanked both on the north and south sides by aisles with a double narthex to the west. The outer surface of the brick walls were not plastered with mortar, but lined with slabs of white marble. The Patriarchal Palace was located in the southwestern corner of Hagia Sophia and was a long, two-story, domed hall that today lies in ruins. The historian of the Justinian era, Procopius, in his book Buildings of Justinian, describes in detail the construction of the church. It is known from the sources that the first dome collapsed in 558 after an earthquake. The new dome’s diameter of 31 meters and height of 55.6 meters, from floor level, was designed by Isidore the Younger, who was the nephew of the original architect. 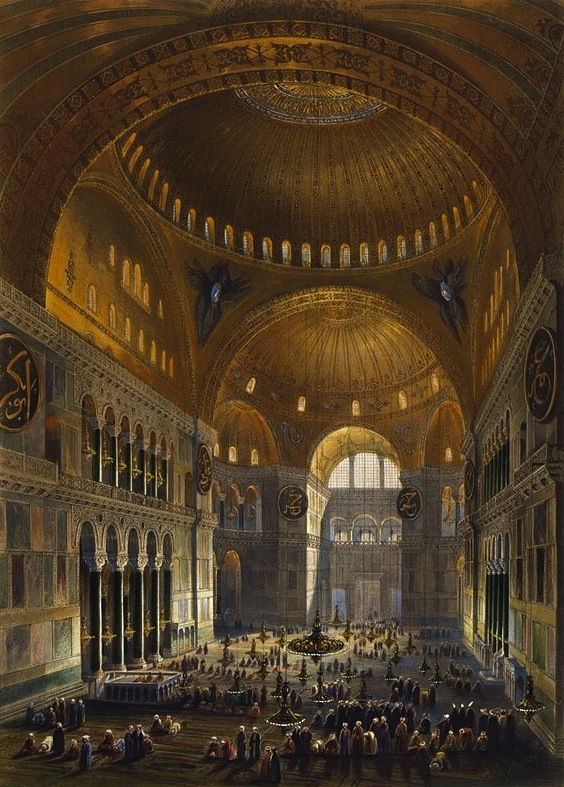 Interior of Hagia Sophia as rendered by Gaspari Fossati in 1852. Lithograph by Louis Haghe, public domain. The 100 windows of the church allow sunlight to illuminate the entire space brightly. The interior walls are covered with colorful marbles and columns of green or red marble bearing capitals of white marble. Historical evidence can provide us only a faint idea about the luxury of the lost decorations. The altar was decorated with gold and semiprecious stones and topped with a silver ciborium. The iconostasis was made of marble slabs and silver columns, the pulpit from marble and ivory. The precious relics, kept in the sacristy, were innumerable. The interior decoration with gilded mosaics was so impressive that it inspired awe in the faithful. Travellers from Kiev, who visited the monument in 988, were so overwhelmed that they reported not knowing if they were in heaven or on earth. Initially, in the Justinian era, the church was decorated with non-representational mosaics (crosses, geometric designs, acanthus), with the oldest surviving figurative mosaics dating to the period after the end of iconoclasm in 843. Southwestern entrance mosaic of Hagia Sophia. The Virgin Mary is standing in the middle, holding the Child Christ on her lap. On her right side stands emperor Justinian I, offering a model of the Hagia Sophia. On her left, emperor Constantine I, presenting a model of the city. 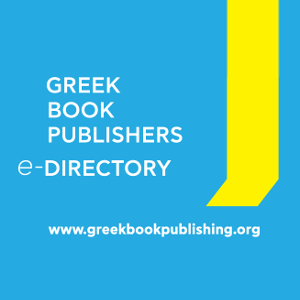 Public domain. 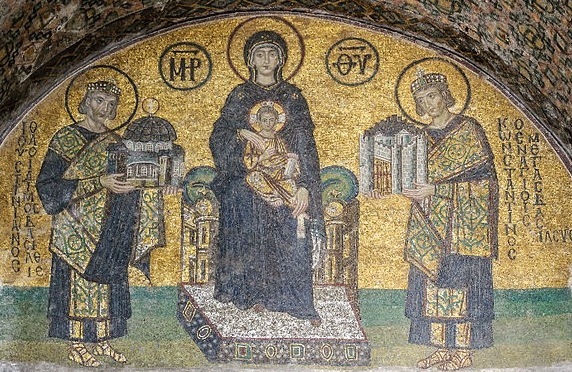 A wonderful example from the 10th century in the inner narthex shows the Virgin and Child enthroned, flanked by Constantine the Great and Justinian, who present her with models of the City and Hagia Sophia respectively. Another exquisite mosaic over the Royal Gate depicts Emperor Leo VI kneeling before the enthroned Christ. 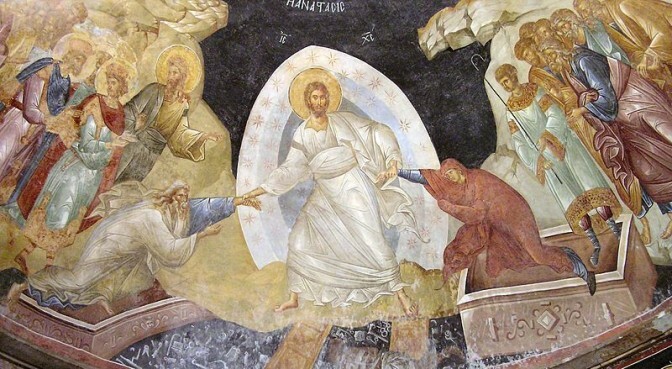 The resurrection fresco in the Chora Church, public domain. 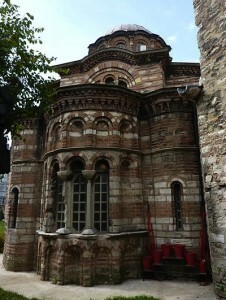 This unique combination of elegant Late Middle Byzantine architecture and painting is located on the sixth hill of Constantinople, outside the orginal walls of Constantine the Great and the location is probably why it was named Chora – meaning countryside. The church, dedicated to Christ the Savior and the Virgin Mary, was founded in the 11th century by Maria Doukaina, mother-in-law of Emperor Alexios Komnenos, while in the 14th century, Theodore Metochites, a senior official of the state and a great scholar, built the outer narthex and the south chapel. Most importantly, the church is decorated with excellent mosaics and frescoes and preserved in the inner narthex one fresco shows Metochites offering a model of the church to Christ. Pammakaristos Monastery Church, courtesy of Vladimir Menkov, CC. 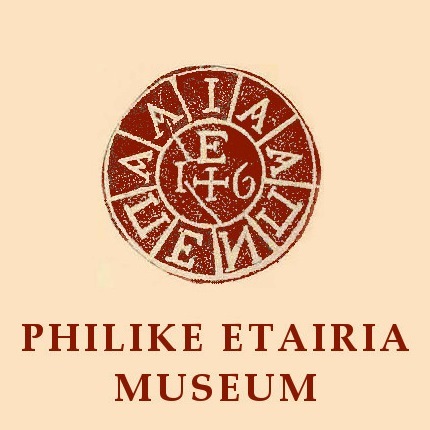 The Pammakaristos monastic complex, which played an important role in the history of the City, was built in the 13th century, during the reign of Emperor Andronikos II Palaiologus. Here are buried the Emperor Alexios I Komnenos, his daughter Anna Komnene and many members of the Palaiologos dynasty. The monastery belongs to the type of one-room domed church and retains almost intact the marvelous façades, where bricks and stones alternate with ornate marble details. In the 14th century the southern burial chapel was added, which is dedicated to Christ and has mosaics of exquisite craftsmanship. After the conquest of Constantinople by the Ottomans the Pammakaristos Monastery served as the seat of the Ecumenical Patriarchate for about a century until its conversion into a mosque. Church of Saints Sergius and Bacchus, courtesy of Vladimir Menkov, CC. This extremely ornate church was built in the 6th century at the beginning of the reign of Justinian and is by many considered to have been a model for the construction of Hagia Sophia a few years later. The Ottomans named it Küçük Ayasofya Camii, meaning “little Hagia Sophia.” It was located between two important buildings, which have since been destroyed: the palace of Hormisdas where Justinian lived with Theodora before being crowned emperor and the church of Saints Peter and Paul. The outside masonry consists of ordinary bricks and forms a plan of an irregular octagon within a rectangle. The large central dome, which consists of 16 sides with eight windows, rests on 8 wide arches supported by eight massive piers. The two-story ambulatory spaces between the piers is occupied by 28 marble columns. The alternation of green and red marble columns, the fine monograms of Justinian and Theodora on the column capitals and the carved Greek inscription running along the architrave with the names of the church founders make the monument probably the second most important church in Constantinople after Hagia Sophia. 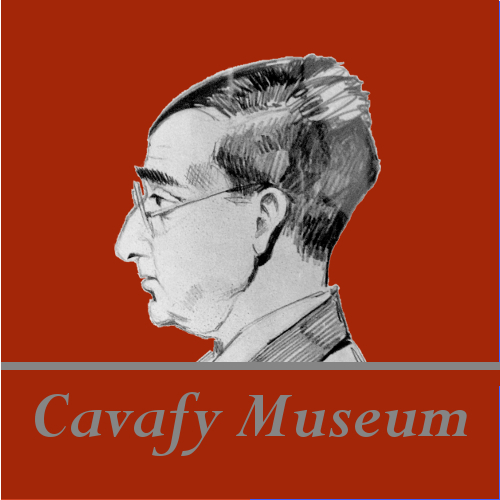 Virginia Albani, archaeologist, for the HFC.